Welcome to the magical world of Floramonde, the home of Princess Betony! Her father is a king and her mother the spirit of a willow tree, but Princess Betony is supposed to live a boring, organised kind of life, like a proper princess. That doesn’t stop her having magical, exciting adventures, or from making new friends – and only some of them are human! 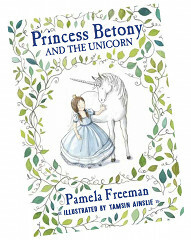 Join her on her adventures in this enchanting new series by award-winning author Pamela Freeman, illustrated by Tamsin Ainslie. Princess Betony's mother is a dryad and misses the Wild Magic of the Dark Forest. When the princess sees her mother running into the Forest, Betony is worried she will never return. Humans are forbidden to enter the Forest. Betony doesn't care. She has to find her mother, no matter what. But first she must catch a unicorn! The Wild Magic has chosen Princess Betony to collect a precious gift that must be protected at all costs. 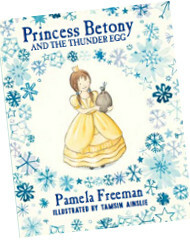 Join Princess Betony as she travels through the Dark Forest where she must find a way past the sticky webs of its giant silver spiders to bring back the mysterious Thunder Egg from the Oldest Under the Mountain. 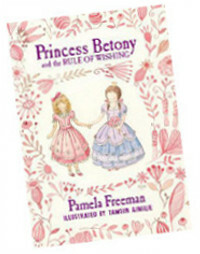 The third exciting book in the series - Princess Betony and the Rule of Wishing - is now available in all good bookshops. Princess Betony is thrilled that she finally might have a friend. Rosie’s niece Clover Pink has come to stay next door for a while and Betony is really looking forward to finding out what a real friend is. It’s not as simple as all that when you are a Princess and your friend to be wants to become a witch and is desperately trying to figure out the Rule of Wishing.